Manual—or pour-over—brewing has become popular in the world of craft coffee, because it gives full control over all of the variables in the brewing process. More control means you have the ability to adjust and perfect your recipe to better highlight the nuanced flavors found in today's high-quality craft coffees. Manual Coffeemaker Nº2 is a pour-over brewer that celebrates the ritual of handmade coffee. MCM lives on the countertop in a home or office, like a low-tech appliance. Hot water is gradually poured through fresh ground coffee in a filter, and brewed coffee slowly drips into the carafe, or even directly into your mug. Manual Coffeemaker Nº2 is a descendant of pour-over coffee brewers of the past, but completely redesigns the experience with a new form. Other manual brewers have more in common with pitchers or kitchen funnels, while MCM is designed to be a freestanding appliance—one that is as beautiful as it is functional. The handmade sculptural glass form of MCM provides unique visibility of the process, while the double-wall design retains brewing heat. MCM can be used with cone or wave filters, depending on your preference and gear. 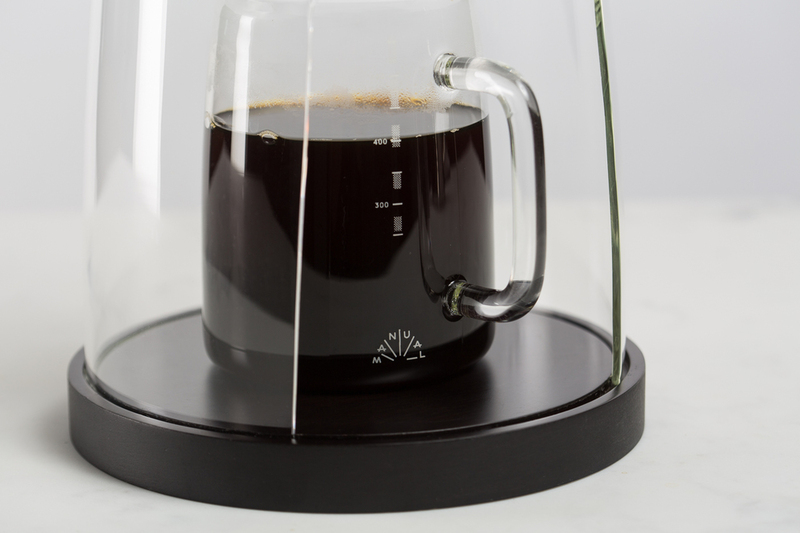 MCM simplifies pour over coffee by eliminating the need for a brewing scale. Instead, the carafe has ml measurements to accurately gauge volume of brewed coffee, and marked "zones" to help assist in more intuitive brewing. The lacquered bamboo base provides a visual anchor for the glass forms. In a world focused on speed and convenience, the act of preparing coffee manually and by-the-cup is a chance to truly slow down and enjoy the moment. As you master a manual brewing method, the ritual of preparing coffee becomes just as pleasurable as drinking it. Manual Coffeemaker was designed to celebrate this ritual of daily craft through a considered experience, a thoughtful interaction and an understated design. Backordered until 2019. Join our mailing list to be the first to know about a pre-order.